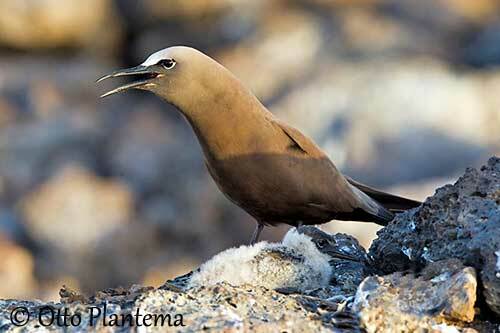 The Brown Noddy is included in the genus Anous, the typical dark-coloured genus. This bird is the largest and the most widespread of this group. The adult has dark chocolate-brown plumage overall, except the pale grey crown, almost white on the forehead. On the upperwing, there is a slightly paler band across the greater coverts. The primaries are black. The long tail is blackish and wedge-shaped. 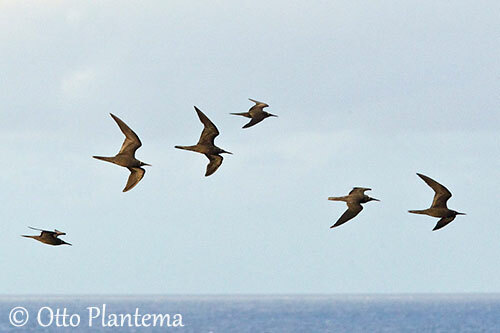 The long, pointed bill is black. The eyes are dark brown, surrounded by narrow, incomplete white eyering. Legs and webbed feet are black to blackish-brown. The female is similar but smaller than male. The non-breeding adult is similar too. The juvenile resembles adult, but it has brown crown and the upperpart’s feathers are edged whitish. There are five subspecies which differ in size and colour tone. 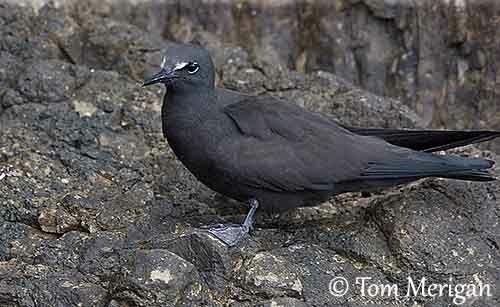 A.s. plumbeigularis occurs in S Red sea and Gulf of Aden. A.s. pileatus is found from Seychelles and Madagascar, E to N Australia, Polynesia, Hawaii and Easter Island. A.s. galapagensis from Galapagos Islands. This one is the darkest, with almost blackish plumage and more or less visible pale grey superloral stripe. A.s. ridgwayi from W Mexico and W Central America, including Cocos Island. It is slightly darker than Pileatus. A.s. stolidus (here described) occurs from Caribbean and S Atlantic Islands, and Gulf of Guinea to Cameroon. 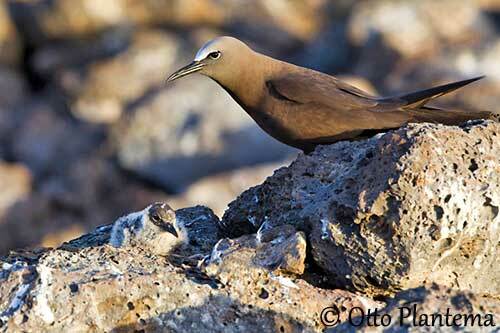 The Brown Noddy occurs on coastal and oceanic islands during the breeding season. It nests on cliffs and offshore rocks, but also sometimes on the ground or in trees. Outside this period, it is found in open ocean. It may roost on water, rocks, islets, ships and flotsam. 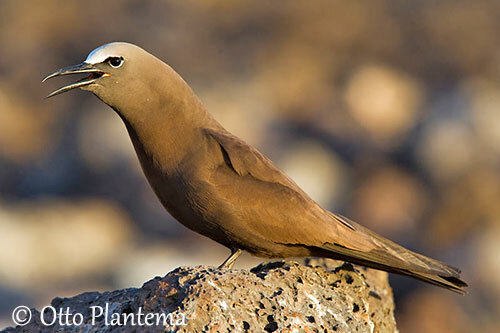 The Brown Noddy gives low-pitched, guttural calls “kaark”, or “arrowk”, or “eye-ak”, similar to the calls of a young crow. It utters other sounds at nest, and the aerial display is accompanied by song “nek nek nek nek nek nekrrr”. 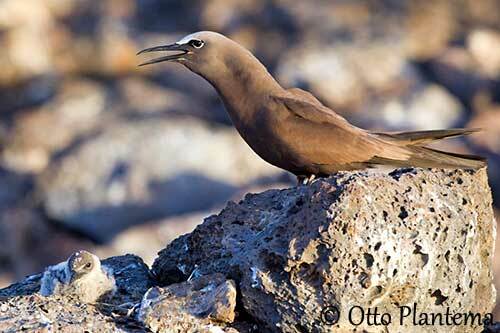 The Brown Noddy feeds mainly on fish and squid. This species does not use plunge-diving. It swims and picks preys from the surface. It also feeds by hover-dipping and contact-dipping. It may perform pattering at surface too, to attract the preys. The flying-fish are caught in the air. 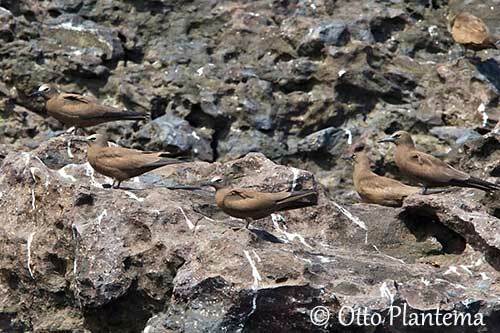 The Brown Noddy steals food from Brown Pelicans in Galapagos. It may forage in small flocks, and follows the predatory fishes such as tuna. It takes advantage of preys driven to the surface by these large fishes. 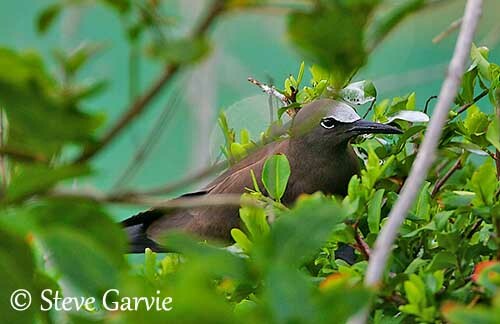 It is often seen foraging along the breaking waves or in coastal lagoons around its nesting-sites on islands. 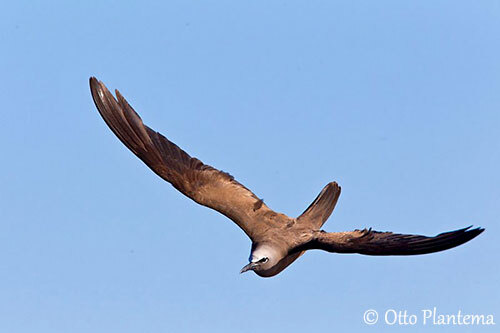 The Brown Noddy breeds in colonies, from small to huge ones, depending on habitat availability. They nest in rocky cliffs, but also docks or jetties, on the ground, both in open or under vegetal cover, in shrubs, trees and cacti. Some displays can be observed, with both mates displaying characteristic “nodding” to one another. Courtship feeding by male to female is more frequent during this period. The male brings back a fish and both mates often take-off and fly high in the air. The female may swallow the fish, or keep it in her bill during these displays. They are monogamous, and both defend the territory. Territorial squabbles can be frequent between neighbours, but also with intruders. 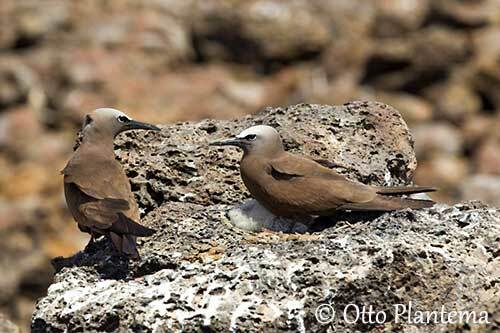 The Brown Noddy is usually present most of the year at tropical colonies, and seasonally absent at subtropical colonies. It often disperses to sea after breeding. It flies above the water or swims on the surface. It is a good flier. 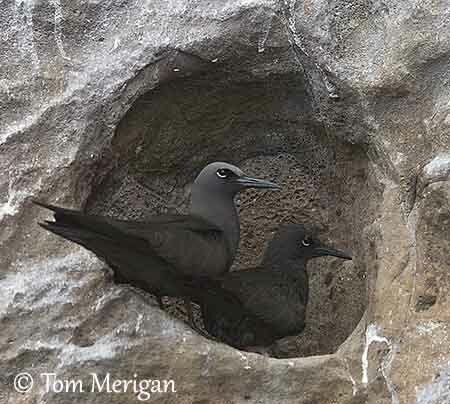 The nest-site varies too, from beaches to cliffs and from bare ground to bushes and tall trees. The nest is placed between 10 cm and 10 metres above the ground. This is a flimsy or bulky structure made with seaweed, twigs or sticks. On the ground, the nest is sometimes a small layer of debris. The nest is bulkier when placed in tree. It can be lined with shells and pieces of coral. The female lays a single pink-buff egg with darker markings. Both sexes incubate during 35-36 days. At hatching, the chick is white to greyish, with some intermediate colours. It is fed by its parents, and fledges about two months after hatching. 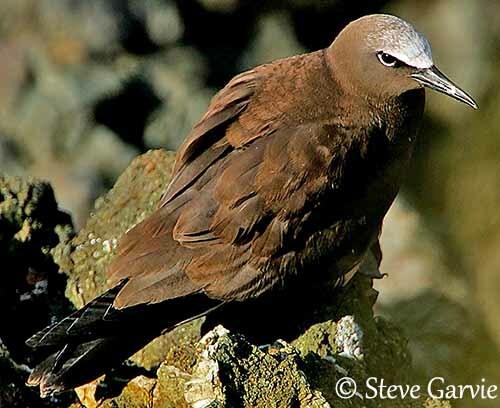 The Brown Noddy is threatened by introduced predators such as cats and rats on the breeding islands. However, the world population is estimated to 300,000/500,000 pairs, and is suspected to be relatively stable.